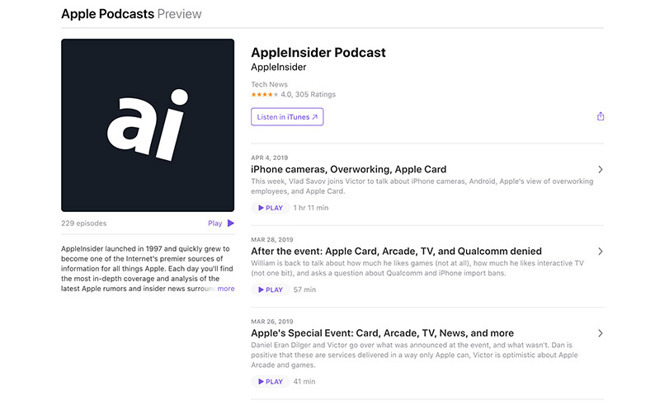 Apple this week pushed out a major revamp to the Apple Podcasts Preview webpage, providing users a refreshed design, the ability to play episodes directly in a web browser, granular episode details and more. Similar to changes made to Apple's iTunes and App Store websites, the new Podcasts Preview for the web features a clean layout that offers at-a-glance information on a given podcast and its episodes. As seen above, a podcast's landing page now displays that show's logo in the top-left corner, beneath which is a counter denoting the number of available episodes and a link to begin playing the latest installment. The podcast title takes up space at the top of the page, while the show's producer is listed below in smaller font. Podcast category is also denoted, while a dynamically updated module displays star ratings. A dedicated iTunes button for downloading episodes in Apple's centralized media hub is joined by a smaller icon for sharing a Podcasts Preview page to Twitter and Facebook. The page's URL can also be quickly copied to the clipboard via the share button. Notably, Podcasts Preview now supports web playback, meaning listeners can stream episodes directly in a web browser. Previously, the interface offloaded users to iTunes for content playback and management. Along with a play button, each episode's title, description, runtime and published date are available in the episodes column. Clicking on an episode's box takes users to a "podcasts.apple.com" URL that includes a show description and options to open in iTunes, share or play in browser. When applicable, a link to a podcast's website is also furnished. The Podcasts Preview update comes on the heels of newly aired rumors claiming that Apple is preparing to break up iTunes in a future version of macOS. Last week, developer Steve Troughton-Smith said as-yet-undisclosed evidence points to development of standalone Music and Podcast apps for Mac, assets currently entangled in iTunes. Apple could be planning to announce the new apps, and with it a dismantling of iTunes, at its Worldwide Developers Conference in June. AppleInsider will be providing live coverage of the event starting June 3. When Apple first introduced the separate from iTunes Podcast app, I must admit, I wasn't impressed. But, over time I've really come to appreciate the stand alone app. Especially, the improvements Apple has made. Specifically, the 60 second fast-forward button. I'll always stick with the trusted Apple Apps over third-party apps. Clearly more evidence that iTunes is going to be deprecated. This is good news.